Lactose intolerance is something that affects a lot of people. It is estimated that as many as one in ten Australians have made at least some changes to their diet to accommodate an inability to properly digest this naturally occurring dairy sugar. During the normal process of digestion, lactose is broken down into glucose by an enzyme known as lactase, and absorbed into the bloodstream. The extent of lactase production varies between people. Some people do not produce lactase at all, while others produce a reduced amount. People tend to grow more intolerant of lactose as they reach adulthood, and lactase production is also determined by genetics, with people from some ethnic backgrounds typically more able to digest dairy products than others. When lactose passes through the gut undigested, it is acted upon by bacteria in the intestine, producing the extremely uncomfortable symptoms of lactose intolerance, which include cramps, diarrhoea, bloating and wind. Lactose intolerance differs from milk allergy, which is an immune response provoked by dairy proteins. While most people obtain their daily protein requirement from eating a balanced diet, bodybuilders and some athletes find it difficult to meet their high protein requirements through food alone, and choose to supplement with protein powder. Additionally, the weight loss benefits of a high protein intake are well known by anyone trying to shed the kilos, and protein powders are extremely popular and effective meal replacements. The gold standard in protein powders is whey, which is derived from dairy. This is, understandably, a deterrent to many people who are lactose intolerant. It may come as a surprise that some whey proteins are so low in lactose they can be tolerated by almost anyone. Additionally, there are a number of high quality non-dairy proteins on the market for those who would like to avoid lactose entirely. Lactose intolerance should not stop anyone from obtaining the body they want. Whey protein comes in two main varieties – concentrate and isolate. Whey concentrate is cheap to make, and typically contains between 60 and 80% protein. It is an excellent, high quality, fast absorbing protein that is great for everyday use. Unfortunately, this type of whey tends to be higher in lactose. On the other hand, whey isolate is an ultra pure product that usually comes in at greater than 80% protein. Unlike whey concentrate, whey isolate is extremely low in fats and sugars, including lactose, making it suitable for most people with an intolerance. It is estimated that a single 30g serving of whey protein isolate contains about 0.1g of lactose, which is well below the 4% lactose content found in whole milk. Many whey isolate powders are also processed in a way that removes carbohydrates, which includes the lactose component. One of the purest protein powders on the market, Species Isolyze has been processed to remove all carbohydrates, all sugars including lactose and all fats. Containing only whey protein isolate as its sole source of protein, Species Isolyze mixes incredibly well and has an equally incredible taste. Designed for trainers who want a fast absorbing protein source, Isolyze has been processed to retain the whey’s natural immunoglobulins, lactoferrins and glycomacropeptides, which can support optimal immunity. IsoPure are an US based brand that specialises in low carb and zero carb protein powders. They’re also known for creating unique protein powders that dissolve clear. Just as with Isolyze, IsoPure’s Zero Carb has been processed to remove all carbohydrates and sugars including lactose. It is also incredibly low in fat with only 1g per serve. The formula has also included a comprehensive range of essential vitamins and minerals to further support optimal health. Along with IsoPure Zero Carb, they also make two other lactose free proteins including their Whey Protein Isolate and Low Carb. One of the most enduring hydrolysed whey proteins in the industry, ISO 100 is available in a massive range of flavours and is not only lactose free, it’s also gluten free as well. ISO100 is also free from fat and provides a super fast absorbing protein powder that is perfect around training times. Made from hydrolysed protein, the powder is essentially pre-digested or broken down into a high percentage of di- and tri-peptides, which are preferentially absorbed into the bloodstream to make its way to the muscles to support immediate recovery and growth processed. If you’re keen to take your progress to the next level, you can’t go past ISO100. People looking to avoid dairy products entirely also have a lot of great options. Here are our favourite dairy free proteins. 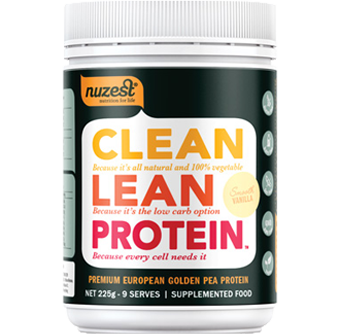 Hailing from New Zealand, NuZest Clean Lean Protein is a pea based protein powder that is not only free from lactose, it’s also gluten free, soy free, nut free, egg free and GMO free. As a completely vegan protein powder, Clean Lean Protein is still incredibly high in protein and low in carbs and fats. Paleo friendly and perfect for those who have common allergens, Clean Lean Protein can be used like other proteins throughout the day and also around workout and training times. It’s easy to mix and although the taste does take a little bit of getting used to, it’s actually not bad at all. For another lactose free pea protein alternative, you could also try Vital Protein. The International Protein Naturals range is one of the companies best releases in the last couple of years. Catering for trainers who want a protein powder free from artificial sweeteners, colours and flavours as well as any unnecessary fillers, one of the more popular products from the range is the Egg White Protein. Free from dairy and lactose, the supplement contains 100% egg white albumen providing 24g of protein per serve and very little else. It’s also an excellent egg white alternative in cooking and baking. For other lactose free proteins from the range, try International Protein Naturals Soy Protein Isolate, Pea Protein and Rice Protein. As the female orientated branch of the iconic Australian supplement company Max’s, Maxine’s produces some of the best supplements on the market. Many of them, although designed for women can easily work just as well for men. The Pure Protein is no different. As a 100% plant based protein, it is dairy free, lactose free, soy free, gluten free and naturally sweetened. Made with a blend of pea and rice proteins along with added ancient grains such as amaranth, quinoa and buckwheat, each serve provides around 18g of protein along with a host of fat burning ingredients such as green coffee extract, green tea extract, African mango and raspberry ketones. 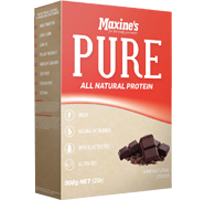 If you’re looking for a more natural, vegan fat loss protein, Maxine’s Pure Protein should be on top of your list.